Trying to find pubs in Prestwick that have a dart board? You’ve come to the right place. We’ve got every pub and bar in the UK listed. Whether you’re looking for a pub or bar to play darts, somewhere to play pool or just want to have a look at a menu before you go, we can help. Crooksmoss Bowling Club in Ayr has a dart board. The pub has live music events, it has a pool table. Northfield Bowling Club in Ayr has a function room that can be booked. The pub has a dart board, it has DJ's. Northfield Bowling Club has karaoke. The pub has live music events, it holds Poker Nights. Northfield Bowling Club has a pool table. The pub holds quiz nights, it shows football on TV. Northfield Bowling Club has terrestrial TV. Drumley Inn in Mossblown has a car park. The pub is a family friendly pub, it serves food. Drumley Inn has free WiFi. The pub has a dart board, it has karaoke. Drumley Inn has live music events. The pub holds Poker Nights, it holds quiz nights. Drumley Inn has a big screen. The pub shows football on TV, it has Sky Sports. Drumley Inn has terrestrial TV. St Andrews Hotel in Ayr has accommodation. The pub has a dart board, it has DJ's. St Andrews Hotel has karaoke. The pub has a pool table, it has a big screen. St Andrews Hotel shows football on TV. The pub has Sky Sports, it has terrestrial TV. Railway Welfare Club in Ayr has a function room that can be booked. The pub has a dart board, it has live music events. Railway Welfare Club holds Poker Nights. The pub has a pool table. Tap O The Brae in Annbank has a beer garden. The pub has an outside area, it has a dart board. Tap O The Brae has DJ's. The pub has karaoke, it has live music events. Tap O The Brae has a pool table. The pub holds quiz nights, it has a big screen. Tap O The Brae shows football on TV. The pub has Sky Sports, it has terrestrial TV. Dan McKays in Troon has a beer garden. The pub has a car park, it gives a warm welcome to dogs and their owners. Dan McKays is a family friendly pub. The pub serves food, it serves real ale. Dan McKays has free WiFi. The pub has a dart board, it has a pool table. Dan McKays is a member of Cask Marque. 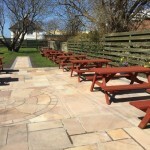 Crown Hotel Tarbolton in Tarbolton has a beer garden. The pub has an outside area, it has a dart board. Crown Hotel Tarbolton has DJ's. The pub has karaoke, it has a pool table. Crown Hotel Tarbolton shows football on TV. The pub has terrestrial TV. Ayr Forehill Bowling Club in Ayr shows live comedy. The pub has a dart board, it has live music events. Ayr Forehill Bowling Club has a pool table. The pub holds quiz nights. Welcome Bar Drongan in Drongan has a beer garden. The pub has a function room that can be booked, it has an outside area. Welcome Bar Drongan has a dart board. The pub has live music events, it has a pool table. Welcome Bar Drongan has a big screen. The pub shows football on TV, it has Sky Sports. Welcome Bar Drongan has terrestrial TV. Fairburn Hotel in Ballochmyle has accommodation. The pub has a beer garden, it has a function room that can be booked. Fairburn Hotel has an outside area. The pub has a dart board, it has DJ's. Fairburn Hotel has karaoke. The pub has live music events, it holds quiz nights. Fairburn Hotel has a big screen. The pub shows football on TV, it has Sky Sports. Fairburn Hotel has terrestrial TV. Mauchline & District Kilmarnock FC Supporters Club in Ballochmyle has a function room that can be booked. The pub has an outside area, it has a dart board. Mauchline & District Kilmarnock FC Supporters Club has DJ's. The pub has karaoke, it has live music events. Mauchline & District Kilmarnock FC Supporters Club holds Poker Nights. The pub has a pool table, it holds quiz nights. Mauchline & District Kilmarnock FC Supporters Club has a big screen. The pub shows football on TV, it has Sky Sports. Mauchline & District Kilmarnock FC Supporters Club has terrestrial TV. 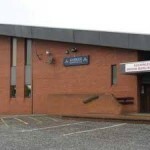 Lodge St John 497 Social Club in Catrine has a function room that can be booked. The pub shows live comedy, it has a dart board. Lodge St John 497 Social Club has DJ's. The pub has karaoke, it has live music events. Lodge St John 497 Social Club holds Poker Nights. The pub has a pool table, it holds quiz nights. Lodge St John 497 Social Club has a big screen. The pub shows football on TV, it has Sky Sports. Lodge St John 497 Social Club has terrestrial TV.